Tag Archive | "international criminal tribunals"
We’ve heard of plenty of nasty dictators of modern history, like Adolf Hitler, Benito Mussolini, Mao Zedong, and Augusto Pinochet. But very little is known about Pol Pot, an equally disturbing figure. What exactly was his deal? Lest we forget the Cambodian genocide. While the Vietnam War began to wane to the east of Cambodia in the 1970s, Pol Pot, a military alias for Saloth Sar, was busy masterminding and ruling over the Communist Party of Kampuchea (“CPK”) (Kampuchea is now known as Cambodia). The CPK successfully overthrew the Lol Non government in 1975, allowing the Party to execute a four-year terror campaign in an attempt to convert Cambodia into a complete agricultural society. Pol Pot’s regime is colloquially referred to as the “Khmer Rouge” – which literally translates to “Red Khmers” in French, a tribute to the CPK. Although dead, Pol Pot is survived by several of his top cadre – four of whom are currently on trial at the Extraordinary Chambers in the Courts of Cambodia (ECCC) in Phnom Pehn, Cambodia. A fifth senior cadre, Kaing Guek Eav, alias “Duch,” was recently convicted of war crimes and crimes against humanity, and sentenced to life in prison for his role as commander of the regime’s infamous prison and torture house, Tuol Sleng (K-21). Duch was responsible for overseeing the death of over 14,000 prisoners of Pol Pot’s Khmer Rouge regime. The international criminal charge of genocide in the case of the ECCC trials is notable in the sense that Pol Pot’s agenda to eliminate certain groups of the Cambodian population was not completely racial, ethnic, or religious in nature. The CPK primarily targeted what it called “New People,” or Khmer Cambodians, living in urban cities like Phnom Penh, and forced them out of these areas and onto either “killing fields,” or agricultural communes, throughout the country. The ECCC is a hybrid domestic court, created as a collaborative effort between the government of Cambodia and the United Nations. A mix of both Cambodian and international judges sit on the panel and oversee the cases. Cambodia’s legal system is a product of its French colonial history, meaning unlike the American legal system of common law, the ECCC employs a French-based indictment procedure that begins at the Office of the Co-Investigative Judges. These “judges” are in charge of compiling any and all evidence that lends to the weight that the accused are guilty of the crimes that they are charged with. After the Judges issued their “Closing Order,” the trials of the accused begin. In the case of the current Khmer Rouge prosecutions, the ECCC decided to try all of the remaining accused together due to their ailing health – and those of each party’s witnesses. Witnesses who testify are subject to cross-examination by all defense counsel of the accused. Each defendant has an international and Cambodian attorney. The witnesses are also subject to cross-examination by Co-Civil Party lawyers – those who are representing individuals suing the Accused for harm suffered during Pol Pot’s regime. Running a hybrid court like ECCC is not an easy task. The Court is currently facing a financial crisis that has forced it to cut back on key staff and reduce the amount of hearings it is able to hold every week. This has placed more pressure on the Court, which is attempting to expedite the trials of the accused due to their advanced age. In addition to funding woes, the Court is constantly under international scrutiny for judicial transparency and corruption. Two international Co-Investigative Judges quit their positions with the Court, citing impropriety of local law enforcement and politicians in their attempts to gather information. 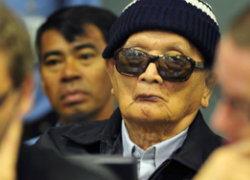 The three accused in the current case on-trial – Nuon Chea, Khieu Samphan and Ieng Sary – have pleaded not guilty to charges that include crimes against humanity, genocide and torture. A fourth defendant, Ieng Thirith, Ieng Sary’s wife, was recently released due to her advanced stages of Alzheimer’s disease. It is unknown whether the Chambers will detain her until she is competent to stand trial, or acquit her of charges. 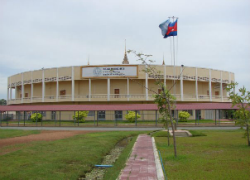 The University of Denver Sturm College of Law is privileged to announce that its International Criminal Law Practicum has entered into an unique agreement with the Trial Chamber of the Extraordinary Chambers in the Courts of Cambodia (ECCC) to provide analysis and research in compliance with the ECCC Internal Rules. Maha Kamal is a staff editor with the Denver Journal of International Law and Policy. She received her BA in International Affairs (specialization in European politics) from the University of Colorado at Boulder in 2007. Maha has previously worked with numerous internationally-focused organizations, including World Denver and the Institute of International Education. She is currently enrolled in the practicum at the University of Denver that is working with the ECCC. A friend at the Extraordinary Chambers of the Courts of Cambodia shared with me this oath read to testifying witnesses. May all the guardian angels, forest guardians, and powerful sacred spirits of Preah Ang Dang Kae, Preah Ang Krapum Chouk, Prcah Ang Svct Chbat, Preah Ang Chck, Preah Ang Cham, Nakta Khlang Moeung, Nalkta Khrihamka, Lakta Dilmbang Dek, Ukta Dambang Kra Nhoung, Uk Yeay Tep, Preah Ang Vihca Suor, Preah Ang Preah ChiviwAt Baray and Preah Ang Wat, Phnom Khleng come forward to preside over this swearing ceremony, since the parties to this matter are in dispute and have alleged that witnesses personally know, have seen, have heard, and have recalled, and the law requires bringing these people to serve as witnesses and to give truthful and accurate testimony. Should anyone answer untruthfully about what they know, have seen, have heard, and remember, may all the guardian angels, forest guardians, Yeay Tep and powerful sacred spirits utterly and without mercy destroy them, and bestow upon them a miserable and violent death by means of bullets, electricity, lightning, tiger bites, and snake strikes, and in their future reincarnation separate them from their parents, siblings, children, and grandchildren, impoverish them, and subject them to miseries for 500 reincarnations. Anyone testifying truthfully without evasion, without lying, without bias because of bloodline, without collusion arising from fear, hatred, material greed, or having taken bribes, may all the guardian angels, forest guardians, Yeay Tep and powerful sacred spirits in the world assist them in long life, good health, an abundance of material possessions and having respectful and loving families until future reincarnation, encountering only good deeds, progress, prosperity and nourish, in accordance with their aspirations. I will answer only the truth, in accordance with what I have personally seen, heard, know, and remember. If I answer falsely on any issue, may all the guardian angels, forest guardians and powerful sacred spirits destroy me, may my material possessions be destroyed, and may I die a miserable and violent death. But, if I answer truthfully, may the sacred spirits assist me in having abundant material possessions and living in peace and happiness along with my family and relatives forever, in all my reincarnations. 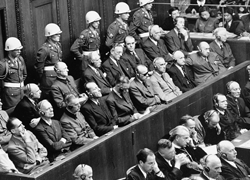 One of the biggest criticisms of the WWII Nuremberg Tribunal was that it was victors justice: the statute only authorized prosecution of crimes committed by the Axis. In addition, both the prosecutors and judges were comprised of nationals from the victorious powers: American, British, French and Soviet. In subsequent tribunals, international justice has sought to avoid the appearance of victor’s justice with different approaches. Some tribunals have sought to seeking a geographic balance in the prosecution team and on the judicial panels. Other tribunals have excluded participation by judges from the states involved in the conflict. Some tribunals have a policy to prosecute perpetrators of mass crimes from all of the major belligerent forces. One fallout from the latter policy of prosecuting all parties to a conflict is the public perception that the crimes associated with the parties are of equivalent gravity. Most legal scholars would agree that the allies committed war crimes against Germany and Japan by using weapons and tactics that either targeted civilian areas or had a disproportionate effect on them. These crimes were never prosecuted, but even so, few scholars would contend that the Allied powers’ crimes during WWII were the equivalent of those of the Nazis. The unqualified decision to commit genocide is not the same as a war crime motivated by an expeditious end of the conflict. The same can be said of Rwanda. The Rwanda Tribunal has only been able to prosecute the main perpetrators, the Hutu extremists who planned and executed the genocide. But many feel that there is substantial evidence of crimes committed by the Tutsi rebel army as it invaded Rwanda that have not been prosecuted. The problem as I see it is that proponents of Tutsi prosecutions frequently argue equivalency of the two crimes. The Tutsi army, the RPF, may well have committed substantial atrocities, and I am a strong advocate of holding perpetrators criminal responsible. International law mandates it in fact. But justice also requires that criminality be fairly apportioned between belligerents. The decision to exterminate a ethnic group is on a different scale than reprisal crimes that occur in the angry aftermath of those crimes. Tribunals have prosecuted both sides of the conflict in Yugoslavia and Sierra Leone as well. Balanced prosecutions help deliver justice to conflict region by avoiding the appearance of bias. However, it is important to not equate prosecutorial balance with moral equivalency.